It has been argued that complex subjective sense of self is linked to the brain default-mode network (DMN). Recent discovery of heterogeneity between distinct subnets (or operational modules - OMs) of the DMN leads to a reconceptualization of its role for the experiential sense of self. Considering the recent proposition that the frontal DMN OM is responsible for the first-person perspective and the sense of agency, while the posterior DMN OMs are linked to the continuity of ‘I’ experience (including autobiographical memories) through embodiment and localization within bodily space, we have tested in this study the hypothesis that heterogeneity in the operational synchrony strength within the frontal DMN OM among patients who are in a vegetative state (VS) could inform about a stable self-consciousness recovery later in the course of disease (up to six years post-injury). 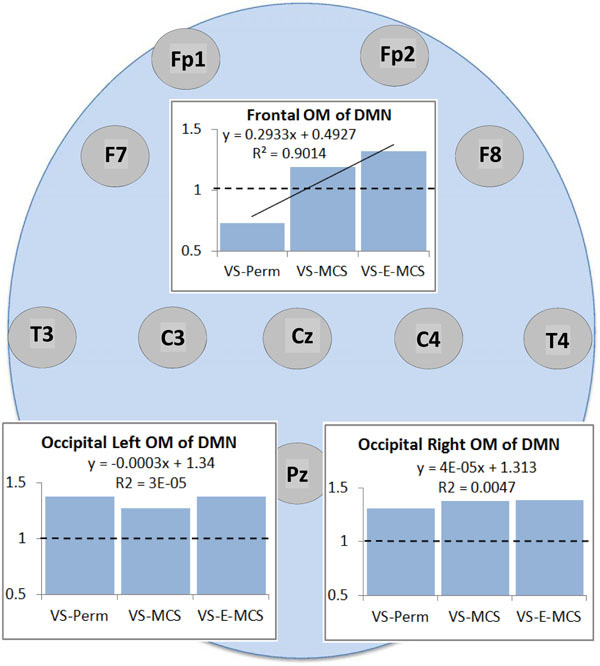 Using EEG operational synchrony analysis we have demonstrated that among the three OMs of the DMN only the frontal OM showed important heterogeneity in VS patients as a function of later stable clinical outcome. We also found that the frontal DMN OM was characterized by the process of active uncoupling (stronger in persistent VS) of operations performed by the involved neuronal assemblies. Keywords: Alpha rhythm, Default-mode network, DMN, Electroencephalogram, EEG, First-person perspective, Functional connectivity, Operational synchrony, Subjective sense of self, Unresponsive wakefulness syndrome, Vegetative state. Studying the functional role of the default-mode network (DMN) has become one of the most rapidly growing neuroscientific and neurocognitive pursuits of the last decade . DMN function has been largely linked to self-referential information processing [2-8]. Based on extensive analysis of the published studies it has been further proposed that such self-referential processing constitutes the core of what is the ‘experiential self’ . Indeed, repeated observations have been made about the relation between the functional connectivity strength within DMN and so-called self-consciousness [9-12]. Furthermore, DMN functional connectivity is absent in brain-dead persons , extremely low in patients who are in a vegetative state (VS)1 [15, 16] and decreased in patients who are in a minimally conscious state (MCS) [13, 16] when compared to healthy subjects. In healthy subjects, the involvement of DMN in the experience of self-conscious is supported by empirical evidence that DMN functional integrity does not exist in preterm infants [17, 18], is underdeveloped in infants  and reaches adult-like integrity only at 6–9 years of age [20, 21] when a full-fledged (adult-like) self-consciousness emerges . Recent studies have provided substantial evidence for considerable heterogeneity between distinct subnets (also referred to operational modules - OMs, ) of the DMN [10, 23-28], thus re-conceptualizing the DMN as consisting of multiple interacting subsystems. At least three OMs within the DMN have been identified: one frontal OM and two bilateral occipito-parieto-temporal OMs . This reconceptualization has clear implications for theories of the DMN’s role in self-referential cognition [12, 28]. Considering the functional and topographical specialization of parietal and frontal OMs  (see also [10, 24, 28-30]), and also the fact that their reactions vary as a function of self-consciousness presence in patients who are in VS/UWS or in MCS , as well as long-term meditation training [Fingelkurts et al., forthcoming], we have proposed that such aspects of the experiential self as the first-person perspectivalness and the sense of agency (the witnessing observer) are realized by the frontal OM, while the posterior OMs are mostly responsible for the continuous experience of ‘I’ (including autobiographical memories) through embodiment and localization within bodily space (right OM)  and self-reflection and a narrative/inner speech (left OM) . Together these subnets provide a coherent representation of the complex self [16, 23]. Capitalising on these findings and conceptualisations about the special role of the frontal OM for the first-person agency of self we hypothesised that there might be different levels of the operational synchrony strength within the frontal OM of the DMN among VS/UWS patients: those who recover stable self-consciousness later in the course of disease (up to six years post-injury) should have stronger frontal OM functional connectivity already at the earlier stage (three months post-injury) compared to those patients who continued to be in the persistent VS/UWS. The current study was aimed to test these predictions. For the purpose of this study we needed to recruit patients who met the accepted international definition of VS/UWS [31, 32] at the early (about 3 months) stage post-injury, with different but stable follow-up outcome up to six years post-injury. Fourteen patients with traumatic brain injury were admitted in Neurorehabilitation Unit at the Fondazione Istituto “San Raffaele - G. Giglio” and met the international definition of VS/UWS [31, 32]. Their EEG registration had been performed about 3 months post-injury. These patients were followed during six years with repeated clinical evaluations of their status. Based on clinical evaluation at six years follow-up after the EEG registration, VS/UWS patients were retrospectively divided into three groups: unrecovered - continued to be vegetative (VS-Pers), recovered minimally conscious state (VS-MCS), and recovered full consciousness - exit from MCS (VS-E-MCS). In order to estimate the expression of clinical self-consciousness [33, 34] the Levels of Cognitive Functioning (LCF) scale score  was assessed on the day of EEG registration (3 months post-injury) and systematically within next six years. The LCF has a linearly graded scale ranging from 1 to 8 (1 - patient is unconscious; 8 - patient is self-oriented and conscious of the environment) and is well correlated with resting-state EEG abnormalities in patients with brain damage [33, 34]. At the time of EEG scanning (about 3 months post-injury), all patients had a LCF score of 1 or 2 (1.3±0.6). Current LCF score (6 years post-injury) was 2 for VS-Pers, 3 for VS-MCS and 8 for VS-E-MCS. Inclusion criteria for patients to be recruited into this study were (a) being alive six years post-injury, (b) confirmation of VS/UWS, MCS or E-MCS in accordance to the internationally established diagnostic criteria [31, 32], (c) first-ever acute brain event; (d) stable LCF score during 3 days after admission; (e) stable clinical status (VS/UWS, MCS or E-MCS) during last 4-6 years following brain injury. Exclusion criteria were (a) death and (b) inconclusive LCF score. These inclusion/exclusion criteria resulted in the recruitment of three patients from the pool of 14 VS/UWS patients: one VS-Pers patient (age = 35 years; CT/MRI: subdural and epidural hematoma in the right hemisphere, and widespread intraparenchymal microhemorrhages), one VS-MCS patient (age = 55 years; CT/MRI: subdural hematoma in the left hemisphere and widespread intraparenchymal microhemorrhages in the right), and one VS-E-MCS patient (age = 19 years; CT/MRI: fronto-temporo-parietal intraparenchymal hemorrhage in the left hemisphere). Due to the very low number of patients who were included in the current analysis the evaluation of the results should be done with caution and should be considered as preliminary. The study was approved by the local institutional Ethics Committee and complies with Good Medical Practice. Informed and overt consent of patients’ legal representatives, in line with the Code of Ethics of the World Medical Association (Declaration of Helsinki) and standards established by the Fondazione Istituto “San Raffaele - G. Giglio” Review Board were acquired. Data use was authorized by means of written informed consent of the VS/UWS patients’ caregivers. The evaluations and manipulations (EEG recording) used for the purpose of this study were part of a routine screening of severe brain-injured subjects during their rehabilitation program and therefore did not interfere with the usual medical practice, or with the everyday rehabilitation therapies. EEGs were recorded with a Neuropack (Nihon Kohden, Japan) from 19 electrodes positioned according to the International 10-20 system (i.e. O1, O2, P3, P4, Pz, C3, C4, Cz, T3, T4, T5, T6, Fz, F3, F4, F7, F8, Fp1, Fp2) during waking resting state. The recording parameters were: 0.5-70 Hz bandpass; 200 Hz sampling rate; ~30 min. The impedance was below 5-10 kΩ. Additionally, an electrooculogram (0.5–70 Hz bandpass) was collected. A full artefact-free EEG stream was fragmented into consecutive 1-minute epochs for every patient. Further data processing was performed for each separate 1-minute portion of the signal. Prior to further processing procedures, every 1-minute EEG-signal was bandpass-filtered (Butterworth filter of the sixth order) in the alpha (7–13 Hz) frequency band. Phase shifts were eliminated by forward and backward filtering. Even though EEG beta-1 and beta-2 frequency bands have also shown dynamics consistent with the analytical model of consciousness , the alpha frequency band was chosen in the current study because: (1) DMN has significant positive correlation with alpha rhythm [37-39]; (2) among several EEG frequency bands only the EEG-signal independent component of the alpha band showed the highest spatial correlation to the DMN template ; (3) alpha oscillations dominate EEG of humans in the absence of exogenous stimuli when internal life (mind-wondering and spontaneous thoughts) is most pronounced [41-44]. In our earlier EEG studies [16, 23] it has been shown that a set of nine operationally synchronized cortical areas indexed by three distinct OMs (frontal OM: F3-Fz-F4; left posterior OM: T5-P3-O1; and right posterior OM: T6-P4-O2) could, in large, account for the DMN (Fig. 1). Similarly, in the current study we have used the following EEG positions (and correspondent to them regional parcellation of the cortex, ) among which the strength of operational synchrony was calculated within three distant OMs: F3/F4 (left/right middle frontal gyri or Brodmann’s area 8), Fz (bilateral medial areas or Brodmann’s area 6), T5/T6 (left/right middle temporal gyri or Brodmann’s area 21), P3/P4 (left/right precuneus or Brodmann’s area 19), and O1/O2 (left/right middle occipital gyri or Brodmann’s area 18). For the anatomical-topographical correlations of EEG electrode positions the reference study of Koessler et al. was used. That study provides the reference information about a highly precise match between the EEG electrode positions and anatomical areas of the cortex that has been verified through an EEG-MRI sensor system using an automated projection algorithm (for the independent study of correspondence between EEG activity in a given electrode position and a cortical area see ). The operational synchrony strength within every DMN OM was calculated using two-stage data processing. The details of these procedures can be found elsewhere [47, 48]. In the following only a brief overview of the main steps is provided. The first step: EEG signal derived from every studied cortical location was reduced to a temporally organized sequence of almost stationary (quasi-stationary) segments of various duration. To uncover these quasi-stationary segments from the complex nonstationary structure of local EEG signals, an adaptive segmentation procedure was used [47, 48]. As a result of such segmentation every local EEG signal was divided into naturally existing quasi-stationary segments by estimating the intrinsic points of ‘gluing’ between such segments – rapid transitional periods (RTPs). The RTP duration is very short compared to quasi-stationary segments, and therefore can be treated as a point or near-point [47, 48]. Based on the experimental evidence, the proposition has been made that each homogeneous segment in the local EEG signal corresponds to a temporary stable microstate - an operation executed by a neuronal assembly . The temporal coupling (synchronization) of such segments among several local EEG recordings then, reflects the synchronization of operations (i.e. operational synchrony), produced by different neuronal assemblies (located in different cortex regions) into integrated and unified patterns - OMs - responsible for complex mental operations . DMN operational modules. Dark blue shapes indicate OMs in which the statistically significant (p < 0.05) values of operational synchrony among EEG locations that are involved in the OMs are mapped onto schematic head map. Abbreviations: DMN: default mode network; OM: operational module. The second step of analysis signifies measurement of operational synchrony through an estimation of the statistical level of RTPs temporal coupling between two or more local EEG recordings [47, 48]. The result of the measure tends toward zero if there is no synchronization between EEG segments derived from different EEG channels and has positive (‘active’ coupling) or negative (‘active’ decoupling) values where such synchronization exists [47, 48]. The strength of EEG operational synchrony is proportional to the actual (absolute) value of the measure: the higher this value, the greater the strength of functional connection. Using the described pair-wise analysis, operational synchrony was identified in several (more than two) EEG channels, thus signifying the estimation of OMs. Within an OM all pairs of EEG channels have to have statistically significant synchrony linking them together [47, 48]. For each analysed state (VS-Pers, VS-MCS, and VS-E-MCS), averages and respective standard deviations were calculated for the strength values of EEG operational synchrony within each DMN OM across all corresponding 1-minute EEGs (n of 1-minute EEGs for VS-Pers = 20, n for VS-MCS = 26, n for VS-E-MCS = 19). Robust linear regression analyses were performed across three states (VS-Pers, VS-MCS, and VS-E-MCS) to test for the relations (trend estimation) between the changes observed across states of consciousness (up to 6 years post-injury) and the studied DMN OMs at 3 months post-injury. Such linear regression analysis estimates a “trend line” which is used to argue that a particular parameter caused observed changes at a particular point in time . R-squared (R2) – indicates the square of the residuals of the data after the fit. R2 value of 0.8-0.9 indicates a nearly perfect fit of the prediction to the data, and R2 value of 1 indicates a perfect fit. From a purely statistical point of view, it is feasible to estimate the regression line with as few as 3 estimates if the data change is not random ; therefore the three states in our study (VS-Pers, VS-MCS, and VS-E-MCS) are sufficient for this analysis. Moreover, in trend analysis (linear regression) the observations (or units of analysis) relate to time periods (years, months, days) and not to individuals . Fig. (2) presents the mean values and result of linear regression analyses for a strength of operational synchrony within the three OMs of the brain DMN across VS-Pers, VS-MCS and VS-E-MCS conditions. We observed that among the three DMN OMs only the frontal OM showed a linear increase (R2 = 0.9) in strength of functional connections as a function of later (up to 6 years post-injury) stable clinical outcomes: from VS/UWS state (VS-Pers) to minimally conscious state (VS-MCS) and further to the emergence from minimally conscious state (VS-E-MCS). On the contrary, the left and right OMs do not show significant trend lines across the three states (Fig. 2). Operational synchrony strength within three OMs of the brain DMN in VS/UWS patients as a function of future (up to 6 years post-injury) stable clinical outcome: Linear regression analysis. Data in graphs are averaged across corresponding EEG channels that constitute each of the DMN OMs and all 1-minute EEGs for each state. The Y-axis presents values of strength of operational synchrony. Horizontal dotted lines in the graphs represent the upper stochastic level of connectivity. Below this threshold any connectivity is random. Solid line in the upper graph represents the linear regression equation and R2. 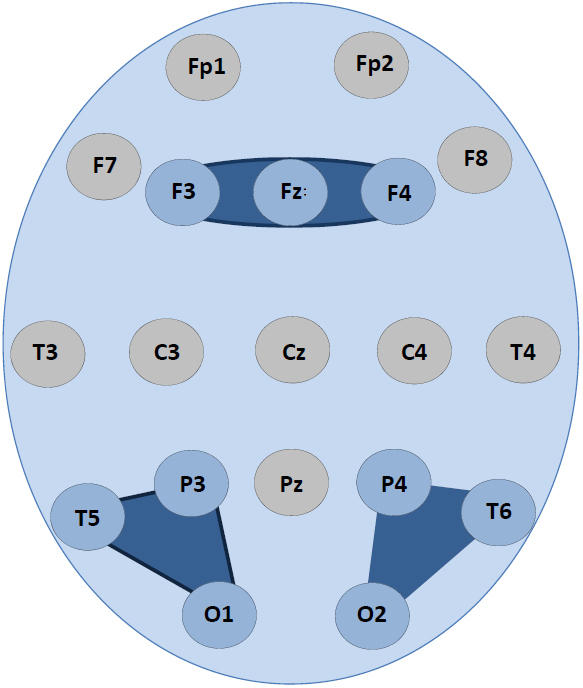 Circles indicate the EEG electrode locations (some locations are hidden behind the graphs representing the OMs, refer to Fig. (1)). Abbreviations: OM: operational module; DMN: default mode network; VS/UWS: vegetative state / unresponsive wakefulness syndrome; EEG: electroencephalogram; VS-Pers: patient continues to be in persistent vegetative state; VS-MCS: patient continues to be in minimally conscious state; VS-E-MCS: patient emerges from minimally conscious state. Fig. (3) presents the number of negative EEG connections within the frontal OM of DMN. Such negative connections (below lower stochastic threshold) mark ‘active’ decoupling of operations performed by topographically distant neuronal assemblies. The largest number of negative EEG connections (27 %) was observed in the VS/UWS patient who continued to be in such a state during further 6 years (VS-Pers), while the lowest number of negative EEG connections (7 %) was in the VS/UWS patient who regained the stable emergence from minimally conscious state (VS-E-MCS) for many years (up to 6) post-injury. The VS/UWS patient who reached a stable minimally conscious state had an intermediate number of negative EEG connections (13 %). The differences among these values reached a liner trend (R2 = 0.95). 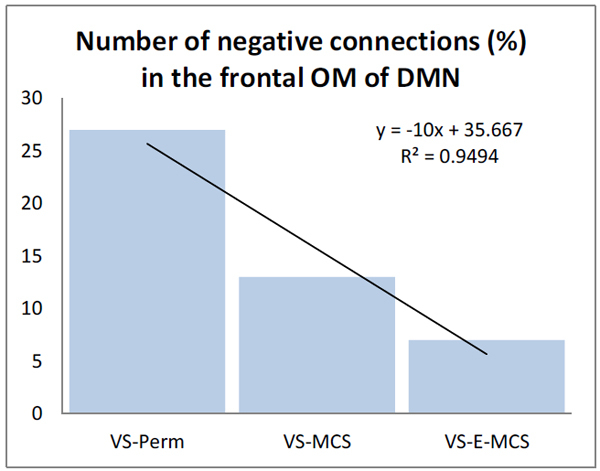 The number (in %) of negative functional connections within the frontal OM of the DMN in VS/UWS patients as a function of future (up to 6 years post-injury) stable clinical outcome: Linear regression analysis. Data are averaged across all 1-minute EEGs for each state. Solid line in the graph represents the linear regression equation and R2. Abbreviations: OM: operational module; DMN: default mode network; VS/UWS: vegetative state / unresponsive wakefulness syndrome; EEG: electroencephalogram; VS-Pers: patient continues to be in persistent vegetative state; VS-MCS: patient continues to be in minimally conscious state; VS-E-MCS: patient emerges from minimally conscious state. The results of this study (though being preliminary) are in line with the hypothesis provided in the Introduction. We have found that despite the fact that all participating patients were in VS/UWS on the day of EEG registration (about 3 months post-injury), among the three DMN OMs only the frontal OM showed important heterogeneity as a function of future stable clinical outcome. Those VS/UWS patients who recovered stable minimal or full self-consciousness later in the course of the disease (up to six years post-injury) showed stronger frontal OM functional connectivity already at the earlier stage (three months post-injury) compared to the patient who continued to stay in the persistent VS/UWS2 (Fig. 2). In fact this persistent VS/UWS patient was characterised by the stochastic level of synchrony in the frontal OM (concluded to be connectively disrupted). Furthermore, besides having very low values of functional connectivity, the frontal DMN OM was also characterized by the process of active uncoupling (stronger in persistent VS/UWS) of operations performed by neuronal assemblies (Fig. 3), whose proper synchrony within a unified frontal subnetwork of the DMN has been suggested to be important for maintaining self-awareness [16, 23, 51-54]. 2 An important clarification needs to be made: despite the variability in the frontal DMN OM integrity as a function of the stable future clinical outcomes (persistent VS/UWS, MCS or even E-MCS), all studied patients were still in VS/UWS condition during the EEG registration and the strength of the operational synchrony in the DMN OMs did not differ from the analogues group level synchrony estimates of patients in VS/UWS . integrity of only the frontal OM among all studied subnets of the DMN showed variability in the VS/UWS patients as a function of future recovery of self-consciousness (Fig. 2). As the result of the present findings and considering the findings of the previous studies, we propose here that it is the frontal DMN module that grants a critical quality for the sense of self (experience of agency) for the whole spectrum of human behaviors and activities (see also ). It is the foundation upon which our ‘autobiographical’, ‘narrative’ and ‘social’ selves (represented by both posterior OMs) are built. This conclusion is further supported by the evidence that the frontal brain areas are reciprocally and densely connected with nearly all other cortical, subcortical, and brainstem structures [64, 65], and thus, represent some kind of a hub that integrates motivational, emotional, sensory, motor, and mnemonic information, serving as the ‘observing self’ to maintain any conscious state regardless of the precise thought content [23-51, 52- 65]. Following this idea, if an extremely low level of operational synchrony in the frontal OM of the DMN marks the condition of absence of the representational content from the first-person perspective, it is conceivable that restoring normal levels of such synchrony in the frontal DMN OM could ameliorate brain dysfunction and thus drive the recovery of complete self-consciousness and eventually the full consciousness in VS/UWS patients. Although the present study is preliminary due to a very small number of patients for each condition, the findings of this study are consistent with the group results in previous studies with DOC (disorders of consciousness) patients [16, 66]. Upon the further validation in a much larger sample of VS/UWS patients, such results may provide novel insights towards potential development of new therapeutic interventions for VS/UWS and generally for DOC patients. Alternative interpretation of the results of this study may relate to the age and the extent of the brain damage (see Patient Cohort section). Even though such interpretation may be valid for the youngest patient with the smallest brain damage who recovered full consciousness, it fails with the patient who continued to “stay” in the VS/UWS and who had the intermediate age and brain damage when compared with MCS patient and E-MCS patient (see Patient Cohort section). Therefore, it is unlikely that age and extent of brain damage could explain the results of the current study. Further weight for this conclusion can be found in  where it has been argued with a number of examples that loss of consciousness is related to functional alterations in cortical structures and impairment in relations between them, rather than to particular brain lesions and the amount of brain damage. 1 Recently named “unresponsive wakefulness syndrome” (UWS) . 2 An important clarification needs to be made: despite the variability in the frontal DMN OM integrity as a function of the stable future clinical outcomes (persistent VS/UWS, MCS or even E-MCS), all studied patients were still in VS/UWS condition during the EEG registration and the strength of the operational synchrony in the DMN OMs did not differ from the analogues group level synchrony estimates of patients in VS/UWS . Callard F, Smallwood J, Golchert J, Margulies DS. The era of the wandering mind? Twenty-first century research on self-generated mental activity. Front Psychol 2013; 4: 891. Christoff K, Ream JM, Geddes LP, Gabrieli JD. Evaluating self-generated information: anterior prefrontal contributions to human cognition. Behav Neurosci 2003; 117(6): 1161-8. Wicker B, Ruby P, Royet JP, Fonlupt P. A relation between rest and the self in the brain? Brain Res Brain Res Rev 2003; 43(2): 224-30. Lou HC, Luber B, Crupain M, et al. Parietal cortex and representation of the mental self. Proc Natl Acad Sci USA 2004; 101(17): 6827-32. Vogeley K, May M, Ritzl A, Falkai P, Zilles K, Fink GR. Neural correlates of first-person perspective as one constituent of human self-consciousness. J Cogn Neurosci 2004; 16(5): 817-27. Gusnard DA. Being a self: considerations from functional imaging. Conscious Cogn 2005; 14(4): 679-97. Schilbach L, Eickhoff SB, Rotarska-Jagiela A, Fink GR, Vogeley K. Minds at rest? social cognition as the default mode of cognizing and its putative relationship to the “default system” of the brain. Conscious Cogn 2008; 17(2): 457-67. Lou HC, Luber B, Stanford A, Lisanby SH. Self-specific processing in the default network: a single-pulse TMS study. Exp Brain Res 2010; 207(1-2): 27-38. Northoff G, Heinzel A, de Greck M, Bermpohl F, Dobrowolny H, Panksepp J. Self-referential processing in our brain-a meta-analysis of imaging studies on the self. Neuroimage 2006; 31(1): 440-57. Uddin LQ, Kelly AM, Biswal BB, Castellanos FX, Milham MP. Functional connectivity of default mode network components: correlation, anticorrelation, and causality. Hum Brain Mapp 2009; 30(2): 625-37. Greicius MD, Krasnow B, Reiss AL, Menon V. Functional connectivity in the resting brain: a network analysis of the default mode hypothesis. Proc Natl Acad Sci USA 2003; 100(1): 253-8. Molnar-Szakacs I, Uddin LQ. Self-processing and the default mode network: interactions with the mirror neuron system. Front Hum Neurosci 2013; 7: 571. Boly M, Tshibanda L, Vanhaudenhuyse A, et al. Functional connectivity in the default network during resting state is preserved in a vegetative but not in a brain dead patient. Hum Brain Mapp 2009; 30(8): 2393-400. Cauda F, Micon BM, Sacco K, et al. Disrupted intrinsic functional connectivity in the vegetative state. J Neurol Neurosurg Psychiatry 2009; 80(4): 429-31. Fransson P, Skiöld B, Horsch S, et al. Resting-state networks in the infant brain. Proc Natl Acad Sci USA 2007; 104(39): 15531-6. Fransson P, Skiöld B, Engström M, et al. Spontaneous brain activity in the newborn brain during natural sleep-an fMRI study in infants born at full term. Pediatr Res 2009; 66(3): 301-5. Gao W, Zhu H, Giovanello KS, et al. Evidence on the emergence of the brain’s default network from 2-week-old to 2-year-old healthy pediatric subjects. Proc Natl Acad Sci USA 2009; 106(16): 6790-5. Fair DA, Cohen AL, Dosenbach NU, et al. The maturing architecture of the brain’s default network. Proc Natl Acad Sci USA 2008; 105(10): 4028-32. Thomason ME, Chang CE, Glover GH, Gabrieli JD, Greicius MD, Gotlib IH. Default-mode function and task-induced deactivation have overlapping brain substrates in children. Neuroimage 2008; 41(4): 1493-503. Allport GW. Personality: A Psychological Interpretation. New York: Holt 1937. Fingelkurts AnA, Fingelkurts AIA. Persistent operational synchrony within brain default-mode network and self-processing operations in healthy subjects. Brain Cogn 2011; 75(2): 79-90. Andrews-Hanna JR, Reidler JS, Sepulcre J, Poulin R, Buckner RL. Functional-anatomic fractionation of the brain’s default network. Neuron 2010; 65(4): 550-62. Spreng RN, Grady CL. Patterns of brain activity supporting autobiographical memory, prospection, and theory of mind, and their relationship to the default mode network. J Cogn Neurosci 2010; 22(6): 1112-23. Leech R, Kamourieh S, Beckmann CF, Sharp DJ. Fractionating the default mode network: distinct contributions of the ventral and dorsal posterior cingulate cortex to cognitive control. J Neurosci 2011; 31(9): 3217-24. Sestieri C, Corbetta M, Romani GL, Shulman GL. Episodic memory retrieval, parietal cortex, and the default mode network: functional and topographic analyses. J Neurosci 2011; 31(12): 4407-20. Andrews-Hanna JR, Smallwood J, Spreng RN. The default network and self-generated thought: component processes, dynamic control, and clinical relevance. Ann NY Acad Sci 2014; 1316: 29-52. Doucet G, Naveau M, Petit L, et al. Brain activity at rest: a multiscale hierarchical functional organization. J Neurophysiol 2011; 105(6): 2753-63. Yeo BT, Krienen FM, Sepulcre J, et al. The organization of the human cerebral cortex estimated by intrinsic functional connectivity. J Neurophysiol 2011; 106(3): 1125-65. Medical aspects of the persistent vegetative state (2). N Engl J Med 1994; 330(22): 1572-9. Fingelkurts AnA, Fingelkurts AIA, Bagnato S, Boccagni C, Galardi G. EEG oscillatory states as neuro-phenomenology of consciousness as revealed from patients in vegetative and minimally conscious states. Conscious Cogn 2012; 21(1): 149-69. Laufs H, Kleinschmidt A, Beyerle A, et al. EEG-correlated fMRI of human alpha activity. Neuroimage 2003; 19(4): 1463-76. Mantini D, Perrucci MG, Del Gratta C, Romani GL, Corbetta M. Electrophysiological signatures of resting state networks in the human brain. Proc Natl Acad Sci USA 2007; 104(32): 13170-5. Jann K, Dierks T, Boesch C, Kottlow M, Strik W, Koenig T. BOLD correlates of EEG alpha phase-locking and the fMRI default mode network. Neuroimage 2009; 45(3): 903-16. Knyazev GG, Slobodskoj-Plusnin JY, Bocharov AV, Pylkova LV. The default mode network and EEG α oscillations: an independent component analysis. Brain Res 2011; 1402: 67-79. Shaw JC. The Brain’s alpha rhythms and the mind. Amsterdam: Elsevier Science BV 2003. Başar E, Güntekin B. Darwin’s evolution theory, brain oscillations, and complex brain function in a new “Cartesian view”. Int J Psychophysiol 2009; 71(1): 2-8. Fingelkurts AlA, Fingelkurts AnA. Short-term EEG spectral pattern as a single event in EEG phenomenology. Open Neuroimaging J 2010; 4: 130-56. Fingelkurts AnA, Fingelkurts AIA. EEG oscillatory states: universality, uniqueness and specificity across healthy-normal, altered and pathological brain conditions. PLoS One 2014; 9(2): e87507. Koessler L, Maillard L, Benhadid A, et al. Automated cortical projection of EEG sensors: anatomical correlation via the international 10-10 system. Neuroimage 2009; 46(1): 64-72. Kaiser DA. QEEG. State of the art, or state of confusion. J Neurother 2000; 57-75. Fingelkurts AnA, Fingelkurts AIA, Neves CF. Natural world physical, brain operational, and mind phenomenal space-time. Phys Life Rev 2010; 7(2): 195-249. Qin P, Northoff G. How is our self related to midline regions and the default-mode network? Neuroimage 2011; 57(3): 1221-33. Baars BJ, Ramsøy TZ, Laureys S. Brain, conscious experience and the observing self. Trends Neurosci 2003; 26(12): 671-5. Feinberg TE, Keenan JP. Where in the brain is the self? Conscious Cogn 2005; 14(4): 661-78. Qin P, Di H, Liu Y, et al. Anterior cingulate activity and the self in disorders of consciousness. Hum Brain Mapp 2010; 31(12): 1993-2002. Musholt K. A philosophical perspective on the relation between cortical midline structures and the self. Front Hum Neurosci 2013; 7: 536. Andrews-Hanna JR. The brain’s default network and its adaptive role in internal mentation. Neuroscientist 2012; 18(3): 251-70. Uhtomskiy AA. Dominanta. Moscow, Leningrad: Nauka 1966. Moran JM, Kelley WM, Heatherton TF. What can the organization of the brain’s default mode network tell us about self-knowledge? Front Hum Neurosci 2013; 7: 391. Sims AC. Symptoms in the Mind: An Introduction to Descriptive Psychopathology. Amsterdam Elsevier Health Sciences 2003. Revonsuo A. Inner presence: Consciousness as a biological phenomenon. Cambridge: MIT Press 2006. Trehub A. Space, self, and the theater of consciousness. Conscious Cogn 2007; 16(2): 310-30. Nash JD, Newberg A. Toward a unifying taxonomy and definition for meditation. Front Psychol 2013; 4: 806. Raffone A, Srinivasan N, Barendregt HP. Attention, consciousness and mindfulness in meditation. In: Singh NN, Ed. Psychology of Meditation. USA: Nova Science Publishers 2014; pp. 147-66. Fuster JM. Frontal lobes. Curr Opin Neurobiol 1993; 3(2): 160-5. Noack RA. Solving the “human problem”: the frontal feedback model. Conscious Cogn 2012; 21(2): 1043-67. Fingelkurts AnA, Fingelkurts AIA, Bagnato S, Boccagni C, Galardi G. Toward operational architectonics of consciousness: basic evidence from patients with severe cerebral injuries. Cogn Process 2012; 13(2): 111-31.